If you are thinking of taking that first step towards fitness and a healthier lifestyle, Mulligan’s Pharmacy have the event for you. 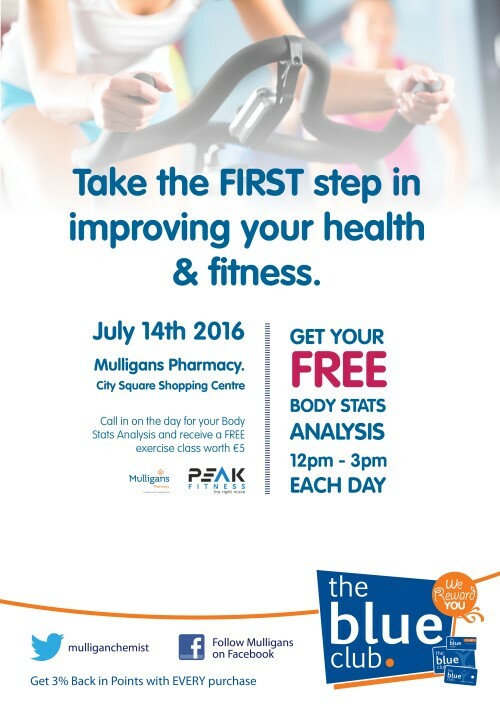 On Wednesday 14th July Mulligans Pharmacy will hold a Fitness Event in their store in City Square from 10am. Drop in and receive your free Body Stats Analysis. The body stats analysis measures your current fitness levels, body fat index, muscle mass and more! Anyone who does so will receive a free gym class worth €5 from the team in Peak Fitness! Go ahead take the first step to improving your health and wellbeing with Mulligans Pharmacy and Peak Fitness. Should you have any questions or want more information, call Mulligans Pharmacy on 051853247.